This was an emotional and sweet book. Devney Perry is a new to me author and I can’t wait to read more of her work. Poppy is happily married to her college sweetheart. He was who she saw herself growing old with. She loses her husband the night before her first wedding anniversary. They were so in love and it’s hard for her to move on. 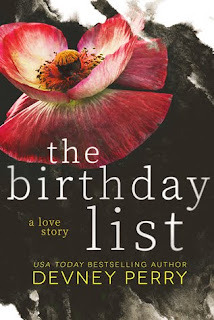 Once she is finally able to start living her life again she decides to do all the things on her husbands list her made. Her husband Jamie made a list he of things he wanted to do before he died. While Poppy is doing things on the list she runs into Cole again. He was the cop who told her the tragic news. He knew who she was the moment he saw her. They are both drawn to each other but she is having a hard time letting anyone in again. I really enjoyed this book and watching Poppy grow into the person she was meant to be. She had to go through a tragic loss and took a journey to honor his memory. This was a sweet story and I am looking forward to reading more of her work.